No matter what your weather is today – I’m sending a bit of sunshine your way with this uplifting tour of a sunny poolside cottage! 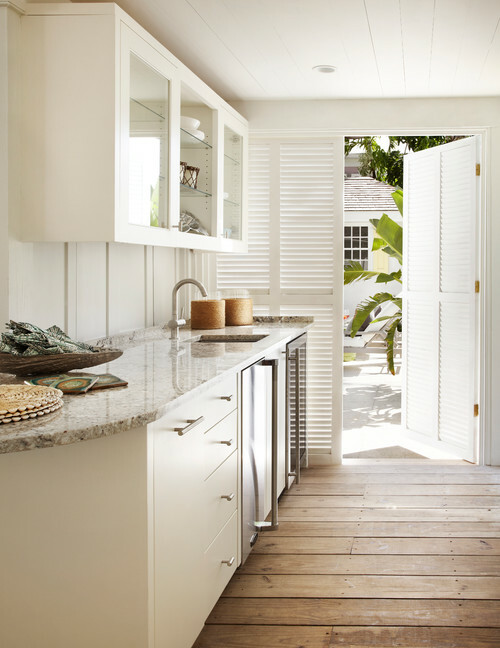 I couldn’t help but smile and be inspired when looking at the interior and exterior spaces of the “Allamanda Cottage” decorated by Laura Hay Decor and Design. 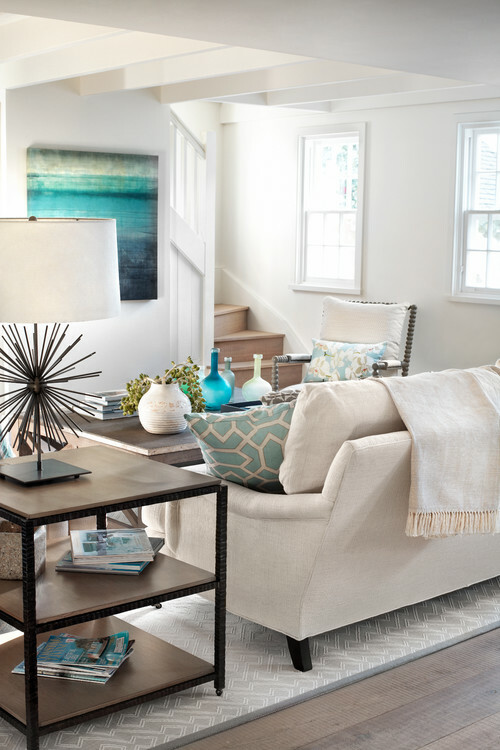 Blue accent pieces wash a feeling of serenity throughout the neutral living room. 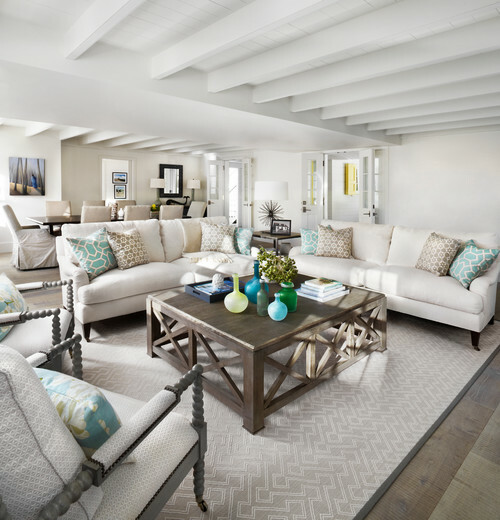 White walls and trim allow the eye to easily flow throughout the space. The result is a peaceful setting for relaxing and enjoying a little down time. 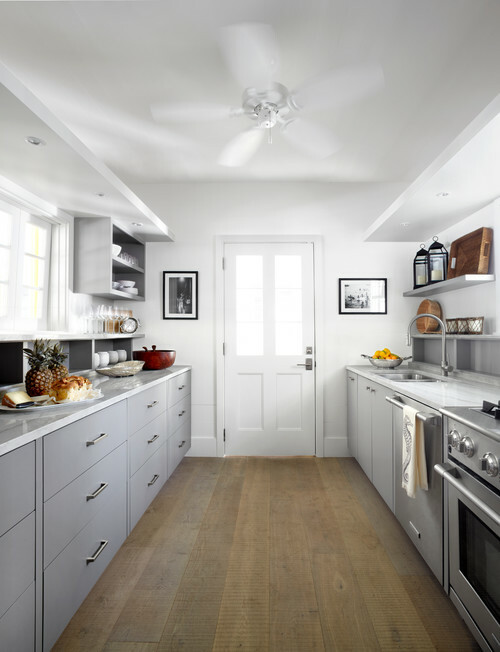 Light gray cabinets add a subtle hint of color in the kitchen. An active ceiling fan keeps summer breezes blowing throughout the cheerful cottage. The kitchen window opens directly to the porch for ease in serving beverages and snacks. Bedrooms in the poolside cottage are just as peaceful and pretty as the rest of the home. Seriously, just looking at these photos is helping calm my nerves! Yellow lends a touch of fun color in a balcony-side bedroom. It would be fun to sleep with the balcony doors open – provided there’s a screen to keep out the bugs. The beauty of the natural wood floors can be seen in this beach style bedroom. I love how the bed is tucked perfectly at the end of the room with a handy light sconce for bedtime reading. The white bathroom is simply decorated. No need for lots of embellishment when trees are dancing outside the windows. A convenient wet bar is located adjacent to the outdoor pool. It’s just a short trip to fetch drinks while enjoying a fun day outside. 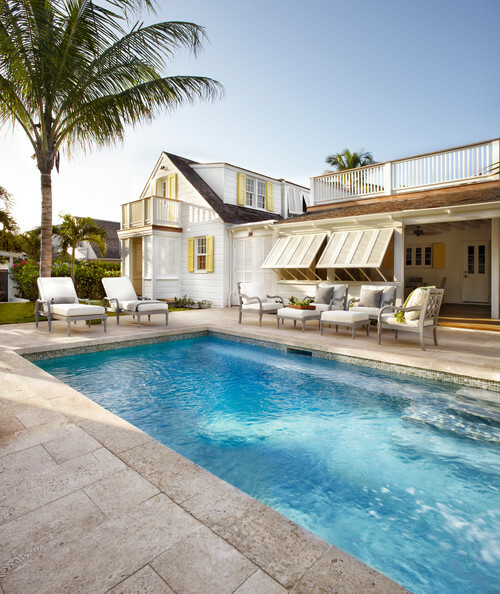 I featured the front exterior photo of this sunny poolside cottage in a previous post about cute summer cottages! I still love it as much today as I did back then. 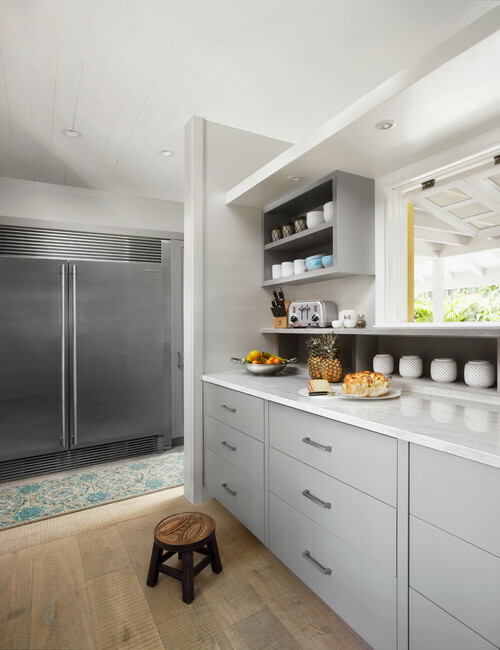 See more photos of the Allamanda Cottage on Houzz.